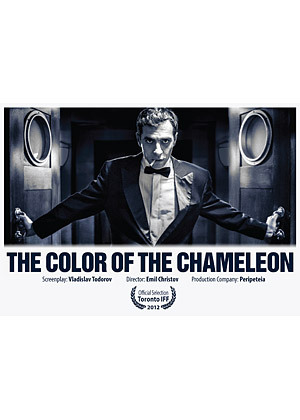 The Color of the Chameleon (Director: Emil Christov): Based on the novel Zincograph by noted Bulgarian academic and novelist Vladislav Todorov, this spy thriller pastiche is the sort of go-for-broke filmmaking that seems increasingly rare in risk-averse Hollywood these days. Jam-packed with literary, cinematic and political jokes and allusions, The Color of the Chameleon will definitely not be everyone’s cup of tea, but I found it an exhilarating and wild ride that by the end takes just a few too many twists. Batko Stamenov (played by the very charismatic Ruscen Vidinliev, who is a pop singer in Bulgaria) seems born into a world of secrets and lies. On her deathbed, the aunt who adopted him after his parents’ death confesses that she’s actually his mother, but later on a doctor informs him that she died a virgin. Recruited to work for the secret police in Communist Bulgaria, Batko seems to have found his calling. He’s assigned to spy on a group of intellectuals called the Club for New Thinking who are studying a novel called Zincograph. The novel is about a man who works as an engraver of zinc plates by day and who spends his evenings creating a fictional web of subversives to deceive the secret police. You might be able to see where this is going. Batko takes a job at Royal Zincography and begins spying and sending his reports. But after a slip-up caused by his landlady, he is fired from his spying job. Without missing a beat, he uses his inside knowledge of the intelligence business to set up his own fake department and continues his assignment. When communism falls in 1989 and many of his targets rise to positions of power in the new “democratic” Bulgaria, he uses his archive to blackmail them. And when his former spymasters discover his game, he outwits them to take his revenge. The Color of the Chameleon is at its best when exploring the Kafkaesque environment of the Communist regime and the film gleefully pokes fun at just about everyone. It’s clear that nobody has clean hands when the old system crumbles, and Batko’s self-interested spy seems no worse than anyone else, just smarter. The film seems to move from the 50s to the present, when in fact it covers only the tumultuous years from 1989 through 1992 or so. It’s a credit to the art direction that Communist Bulgaria in the 1980s could look so grim, but it actually means that the post-Communist scenes are less successful for me. It’s a too-sudden jolt into a more standard Hollywood spy thriller and it lacks the novelty of the rest of the film. One exception is the montage where Batko meets with each of his targets in the new Bulgaria, informing each that he represents a foreign spy agency. To one, he’s the KGB’s man in Sofia, to another he is CIA, and to a third he’s with MI6. Brilliantly staged (including a bowler hat, umbrellas, and typically English rain in the MI6 sequence), these show Batko’s true nature. He’s not a communist or even really a capitalist (though he stands to profit from his information). Instead Batko is that oldest of all character types, the trickster. The one subplot that fails to really work is the romantic one. While working at Royal Zincography, Batko meets a beautiful young woman who works as a projectionist at the local film archive. She shows him Western films including Casablanca, which based on a small subplot, she considers a story about Bulgarians escaping to America. It’s a great way to include some cinematic references, but the romance never feels real (maybe it isn’t?) and the final scenes in black and white aboard a luxury ocean liner seem imagined. In a film as full of imagination and deception as The Color of the Chameleon, it’s quite possible that they are. This entry was posted in Film Festivals, TIFF and tagged #tiff12, bulgaria, communism. Bookmark the permalink.